Vancouver, BC – August 3, 2016 – BAASS Business Solutions (BAASS) partnered with skincare brand, Skoah, in their progressive move from Quickbooks to Intacct, a cloud ERP software provider. With the help of BAASS, spa and skincare brand, Skoah, has chosen Intacct to aid operations in the recent expansion of their business. 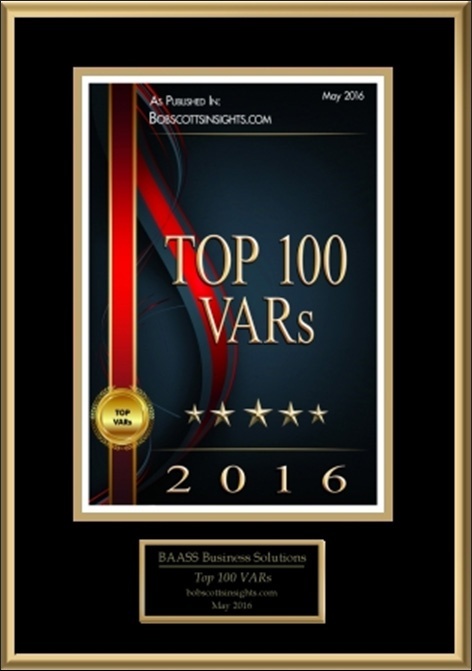 Toronto, ON - BAASS Business Solutions (BAASS), a leading technology consulting firm, has been placed at number 25 in the Bob Scott’s Insights Top 100 VARs for 2016. The Top 100 resellers are chosen from organizations specializing in the sale and implementation of Enterprise Resource Planning (ERP) and accounting software. Toronto, ON – BAASS Business Solutions (BAASS), a leading technology consulting firm, announced an expanded partnership with Intacct, a leading provider of best-in-class cloud ERP software. As an Intacct Business Partner now covering Canada coast to coast, BAASS will sell, implement, support, and develop enhancements for Intacct’s award-winning cloud financial applications. BAASS, already a top Sage partner, is aligning with Intacct in response to increased demand for cloud computing-based applications from its prospects and clients. Toronto, ON – July 22, 2015 – BAASS Business Solutions (BAASS), a leading technology consulting firm, has ranked 18 on Accounting Today’s VAR 100 list for 2015.